Next month I’m going to try to get this information out earlier, but figure it’s better later than never. This is the first week I’m feeling on top of things after the busy holidays and start of the new year. I wasn’t happy with the looseness of my wallet last month so I’m tracking spending very closely this month and not buying anything other than food and gas. We’ve already dined out three times this month but with using coupons the total for those visits is $27 so I don’t feel too bad. Sometimes, picking up two dinners for the price of one is cheaper than cooking! Blog income was $665 for the month. I’ve started pursuing more affiliate opportunities for 2011 for diversification and income growth. The Gift Giveaway Bash drove a lot of traffic and I set new records. Visits were up 28% and page views were up an amazing 63%. I’ll try not to get depressed when I see the results for this month as it would be hard to sustain that growth. I hope December was a good month for you, but that 2011 is even better! I noticed your number one referrer is Wise Bread. Would you recommend new bloggers to join them? Currently I am only in Yakezie. Buck, I would definitely recommend getting listed on Wise Bread’s blog directory. However, my referrals from there fell greatly once they redid the algorithm and I am now on the 2nd page instead of the first. One of the hardest parts of empty nest syndrome is learning to cook for two! 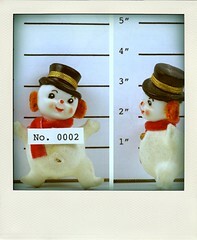 Totally off topic, but that is the funniest snowman mugshot ever!!! I try to find interesting pictures:). Thanks for your help promoting and sending readers my way!